As many of you know FirstDown PlayBook has dedicated this week to attacking quarters coverage with the drop back pass and play-action pass. Today we are going to begin installing the way over due play-action pass protection that will tie into your zone run scheme to the weak side. This will be an important protection as the safeties begin to get active while playing quarters coverage. We will come back later and talk the specifics of this protection but for today and tomorrow just know that you are going to begin to see this protection in FirstDown PlayBook out of multiple formations. This will fit perfectly with the play-action passes that we installed this week. So take a look at this short video to see exactly what we are up to. 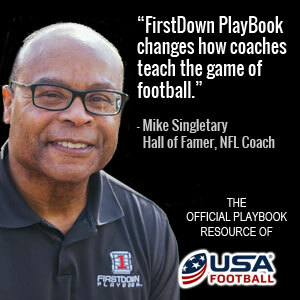 Enjoy the games this weekend but be sure to keep up with all of the FirstDown PlayBook installations as we navigate through the 2017 football season also!